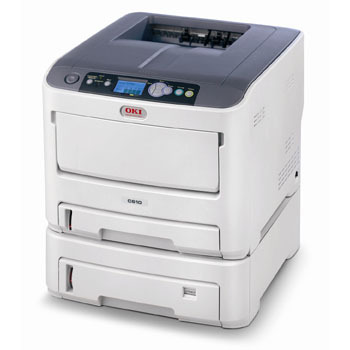 C610 Series Digital Color printers are practically in a class by themselves. 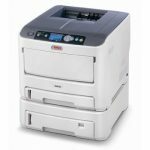 They combine fast, high-quality color output with exceptional performance, including superior print speeds. 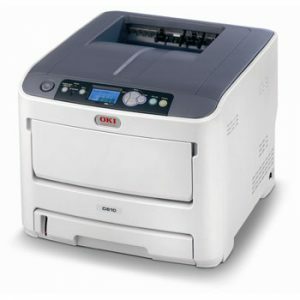 Models come with standard features such as automatic duplex (2-sided) printing (C610dn, -cdn and -dtn4), extra paper capacity (C610dtn4), a 16 GB SD memory card (C610cdn4), plus the legendary OKI reliability. HD Color Printing technology–All four C610 Series models utilize this unique process for breathtaking output. HD Color Printing technology combines multi-level LED printheads and microfine toner for precise toner placement; deep, saturated colors; and fine detail on regular copy paper and glossy media. Rich color pages at up to 32 per minute1–The C610 Series delivers crisp 1200 x 600 dpi color output, with the first page printing in as little as 9 seconds.1 Black & white pages print at up to 34 ppm, the first in aslittle as 8 seconds.1The C610 Series supports PCL® and PostScript® emulations, as well as Windows® Vista® XPS and PDF Direct Print technologies. Flexible paper handling– All C610 Series models have a paper capacity of at least 400 sheets: a 300-sheet paper tray plus built-in 100 sheet multi-purpose tray for labels, envelopes, transparencies, and index stock up to 140 lb. (250 gsm). Use them to print everything from 3″ x 5″ cards, 4″ x 6″ and 5″ x 7″ photo paper, to banner-size sheets up to 8.5″ wide by 52″ in length. Since the more sheets a printer holds means fewer user interventions, the C610 Series can further increase your productivity: the C610dtn holds 930 sheets, with its standard 530-sheet 2nd tray—optional on the other three. All four models have a max paper capacity of 1,460 sheets, with available 2nd tray and 3rd paper trays. Workgroup connectivity built in–Share the advantages and efficiencies of any or all of the C610 Series models through the internal OkiLAN®10/100 Base-T print server. Or make them personal printers by connecting through the high-speed USB 2.0 port. 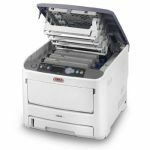 Unmatched warranty support–We’re so confident in the reliable performance of the C610 Series that we provide an industry-leading 5-year warranty on their printheads, and a 1-year limited On-Site printer warranty with optional coverage extensions. 1Published performance results based on laboratory testing – Individual results may vary. 2Requires SD memory card (standard on C610cdn). 3Based on ISO 19798. Printers ship with a complete set of 2,000-page “starter” toner cartridges. 4Estimated life, based on 3 pages per job. Paper Capacity: 400 sheets standard (300-sheet Legal/Letter/Universal Paper Tray + 100-sheet Multi-Purpose Tray) 1,460 sheets max. 930 sheets (with 530-sheet 2nd Paper Tray) 1,460 sheets max. 400 sheets standard (300-sheet Legal/Letter/Universal Paper Tray + 100-sheet Multi-Purpose Tray) 1,460 sheets max. 400 sheets standard (300-sheet Legal/Letter/Universal Paper Tray + 100-sheet Multi-Purpose Tray) 1,460 sheets max.